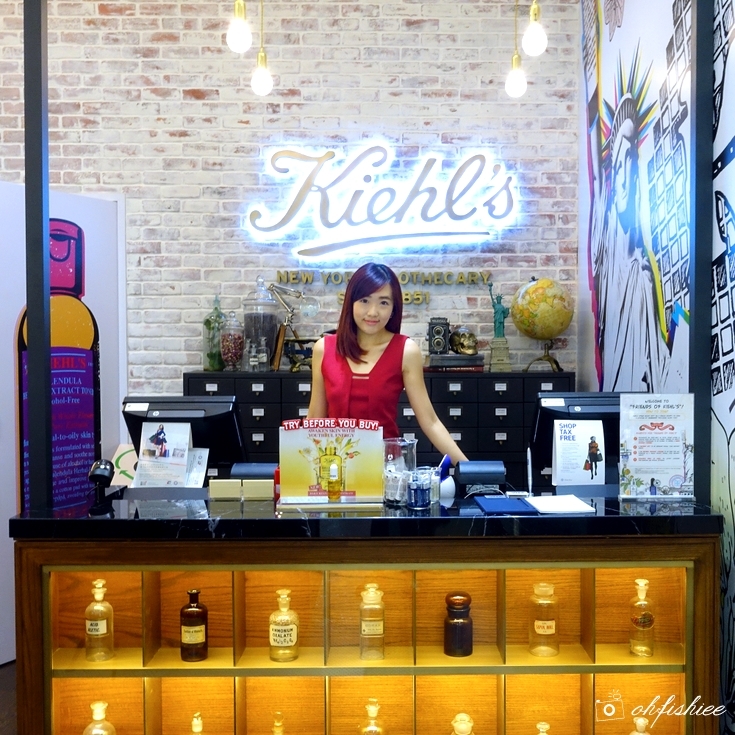 Does Kiehl's store at KLCC look different to you? If you are a regular shopper there, you'd notice they have just relocated its store to a larger space (Same goes to Kiehl's store in Sunway Pyramid!). This is the first Kiehl's Store of The Future, a brand new concept store that is revamped recently. What's in Kiehl's Store of The Future? But now...customers can enjoy even MORE! ❤ The products arrangement is now more organized, making it easy for us to grab what we need for the skin, hair, and body. Plus, the decors look very appealing right? With larger space in-store, it can now accommodate long marble table and product testing bar (Exclude the food ya!) so that you can have a more thorough skin consultation session with the experts there. Does it sound very cozy and relaxing? Well, to me, it's definitely a YES! ❤ Where else can you find such a beauty store that allows you to take your time, try the stuff and decide whether it suits you later? I love the store's concept and design-- Simple but so functional and detailed. Not forgetting to mention, you can have your very own DIY Scent Pouch here for free. Just refer to my previous blog post for more details on Kiehl's natural botanics. ...You can always customize it from the types of products to be included into the gift set, to the complimentary packaging itself! From being a blogger who reviews Kiehl's products, I am also a happy customer of this brand myself. As much as Kiehl's values the customers, I personally value the effective products and amazing level of customer service here. Malaysia will definitely be a better place if more outlets can offer such impeccable services to customers. Thank you KIEHL'S for having me. ❤ Don't forget to visit the nearest Kiehl's store now! wow~~~ It seems more practical with lots of space of deep down skin concultation ler~~ and I want to try Kiehls too! Dear Em, I guess it's "keels", definitely easy to pronounce and remember. Do drop by their outlet when you're free! there is one outlet in Empire. Seldom go inside though as always in hurry, should drop by someday to check out. Hi Pamela, yeah you need to try it out and experience the goodness yourself! Enjoy! I have tried some of their products before. It's really good. Dear Linda, am glad to hear that you found something that suits your skin! ;) Are you still using any of them now? I try their blemish range and i think it work on my skin. Kiehls has been in market for so long. The packaging is simple and the products quality is good. Dear Betty, yes and that's their philosophy! :) This brand has always been emphasizing on functionality and efficacy. I have took their sample last time but until now haven't try it, I think I should use it after read your review. hahaha. Never try their products before. not sure my skin suit to use or not. Thanks for sharing their new concept. Dear Sin Yee, maybe you can try consulting them and take a try on few samples first :) Hope you can find the suitable one that you like! Kiehls is pretty expensive in Malaysia. :( I still had to get my fair share of toiletries in Singapore where it's cheaper after conversion. Dear Sienny, feel free to explore and have fun! Dear Aliza, oh that's nice! :) then you should visit em more often! I did pass by their shop last time, never knew that they got renovatioin! Will head there for sure when I am there =D Hehe! Looking great in your outfit! I got some of their samples. But yet to try em. Dear Ellie, remember to use it quickly especially those in sachet forms ;) don't let them go into waste haha! I keep seeing this shop and I can't help wonder what they offer. But now that I read this I think I'll dropby one time and try their products. Hi Reia, they offer a wide varieties of skin care and body care from head to toe! :) Really worth checking out! I love their products but not always go for it as find it bit expensive. I always come across this brand but havent try out. Hopefully will do soon (with your blogpost as guidance, haha). Hi Anfield, thanks! Haha, I have blogged about Kiehl's for a couple of times, perhaps you can refer to the previous post links that I put in this blog post.